At Your Pace Online offers the most convenient and accessible classes to meet your needs. Our courses are approved by the Nebraska Department of Insurance (DOI) and will satisfy your CE requirements. We never charge you hidden fees or force you to pay for reporting your course, and your classes are available anywhere there's internet! We will report your course completion electronically to the DOI within five business days, and provide a Certificate of Completion for your records. This course provides all 24 hours of CE that you need! This course will review key concepts and principles of Property & Casualty insurance. It includes 3 hours of ethics, and the mandatory exam. No additional reporting fees. This course provides all 24 hours of CE that you need! This course will review key concepts and principles of Life & Health Insurance. In addition to a thorough review of important insurance concepts, this course includes 3 hours of ethics and the mandatory exam, with no additional reporting fees. This course will review key concepts and principles of Life & Health Insurance. This course provides 21 hours of important Life & Health topics, and the mandatory exam. No additional reporting fees. This 8 hour class is approved by the State of Nebraska, and meets the mandatory education requirement to start selling Long Term Care Insurance. No additional reporting fees. This 4 Hour course will meet your one-time Certification Requirements to start selling Life Insurance Annuities in the state of Nebraska. No additional reporting fees. This course applies to producers who need to renew their Long-Term Care Certification to continue selling LTC Insurance. This course will review key principles and concepts related to long-term care insurance policies. No additional reporting fees. This course satisfies 3 hours of ethics training for any Nebraska insurance producer, and applies to producers in all lines. It includes Ethics for Insurance Producers. No additional reporting fees. 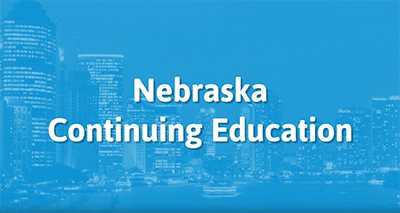 This 3-hour course will meet your one time Certification Requirements to start selling Flood Insurance in the state of Nebraska. No additional reporting fees. Nebraska courses do not expire. Please notify the department when a course is no longer being offered.